If the ROFO tenant doesn't elect to lease the space on the terms offered by the landlord in its notice, the landlord is normally free to try to lease such space to any third party, provided it does so based upon the terms in its notice (or, in some cases, on terms no more favorable than those contained in the landlord's ROFO proposal). In many cases, the landlord must make a deal for the space involved within a certain period of time, or the ROFO will "revive," requiring the landlord to offer the space to the ROFO tenant anew before making a third party deal. This addendum gives the tenant a ROFO for certain additional space for the entire term of the initial lease, and is comprehensive in its approach to tenant improvements, manner of exercise, construction, and other ROFO details. It also contains explicit language concerning rent and adjustment of the tenant's proportionate share of operating costs and taxes following expansion. Landlord and Tenant are executing simultaneously with this Office Lease Addendum (the "Addendum"), a lease (the "Lease") of even date herewith covering certain Premises described in the Lease. This Addendum is incorporated into such Lease, and in consideration of the mutual covenants contained in the Lease, Lessee and Lessor hereby agree that the Tenant shall be granted a Right of First Offer ("ROFO") pursuant to this Addendum as specified herein. 1. ROFO Space. Outlined on Exhibit "1" to this Addendum are areas designated "ROFO Space." At no time during the term of the Lease shall Landlord lease all or any part of the ROFO Space without first having offered to Tenant the option to lease all or part of the ROFO Space on the same terms and conditions as those in the Lease, except for the amount of Minimum Rent which shall be as provided below, and except for Tenant's share of Operating Expenses and Real Estate Taxes which shall increase as provided in Section 4 (e) of this Addendum. If Landlord is willing to lease all or part of the ROFO Space at a Minimum Rent less than that provided in Section 4 (d), Landlord shall so notify Tenant of such fact (plus the amount of Minimum Rent which Landlord is willing to accept for such area), and Tenant shall have the election to lease such area for such lesser amount of Minimum Rent. (a) Each time when Landlord determines to lease all or part of the ROFO Space, Landlord shall notify Tenant of such fact. (b) If Tenant, within thirty (30) days after receipt of Landlord's notice, indicates in writing its agreement to lease the part of the ROFO Space involved, such areas shall be added to and included in the Premises. (c) If Tenant does not indicate within thirty (30) days its agreement to lease the area designated in Landlord's notice, Landlord shall have the right to lease such area within one hundred eighty (180) days thereafter on such terms and conditions as Landlord may determine; except, if Landlord notified Tenant that it was willing to lease such area at a lesser Minimum Rent than that provided in Section 4, then any lease that Landlord enters into may not be for substantially less Minimum Rent than that offered to Tenant. If no lease is entered into within such one hundred eighty (180) day period, any further determination by Landlord to lease all or part of the ROFO Space shall be subject to Tenant's right of first offer as set forth in this Section. (d) The provisions of Section 4 (e) shall apply if Tenant so elects to lease all or any part of the ROFO Space. (3) Tenant's Election to Expand Premises. 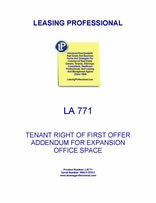 Subject to Landlord's rights pursuant to Section 2 (c), at any time and from time to time during the term of the Lease, Tenant shall have the right, upon written notice to Landlord to lease all or any part of the ROFO Space upon the same terms and conditions pertaining to the Premises contained in the Lease (except that Minimum Rent which shall be as provided below and Tenant's share of Operating Expenses and Real Estate Taxes shall be increased as provided below). Notwithstanding the foregoing, any remaining ROFO Space not leased by Tenant must contain a minimum of one thousand (1,000) square feet of Net Rentable Area, must be immediately adjacent to a public hallway, and must be of such configuration as to be leasable for normal office use, as determined by Landlord in its reasonable discretion. The provisions of this Section shall apply if Tenant elects to lease all or part of the ROFO Space. (4) Terms Applicable to ROFO Space. (a) Final Plans and Specifications. Each time Tenant elects to lease any part of the ROFO Space, Tenant shall notify Landlord in writing of the part of the ROFO Space to be added to the Premises. Upon receipt of such notice from Tenant, Landlord and Tenant shall, at Tenant's sole cost and expense, prepare final plans, specifications and working drawings ("Plans") covering the work and improvements to be done to such part of the ROFO Space. The Plans shall be prepared and agreed upon as soon as reasonably possible after Tenant's election is made, but in no event later than thirty (30) days after Landlord's receipt of Tenant's notice; provided, the failure of Landlord and Tenant to agree on the Plans within such thirty (30) day period shall in no event constitute a default of either party to the Lease so long as the parties are attempting in good faith to reach an agreement. The obligations of Landlord and Tenant to perform the work and supply the necessary materials and labor to prepare the ROFO Space for occupancy shall be set out in the Plans in accordance with the provisions set forth in this Section. Landlord shall, at its sole cost and expense, construct all Standard Building Work (as defined in the Work Letter attached to this Lease), and Tenant shall, at its sole cost and expense, provide for all other work applicable to such ROFO Space (as provided in the Work Letter attached to this Lease).